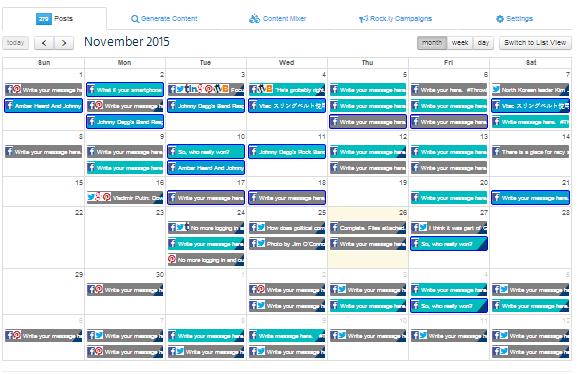 View and manage your social posts by day, week or month in a beautiful calendar view! Reschedule and duplicate your posts by drag-and-drop! Hovering your mouse on a post lets you preview the content. You can click on any date/time slot on the calendar to create and schedule a new post. Drag and drop a published post to a future time slot to duplicate and auto-schedule the post. Drag and drop a pending post to a future time slot to reschedule it. Video marketing on Facebook is an amazing way to increase user engagement, drive traffic and generate tons of leads/sales for your business. According to Search Engine Journal, "Facebook videos reach 2 times more people, receive 2.38 times more likes, 2.67 times more shares, and 7.43 times more comments than YouTube embeds." 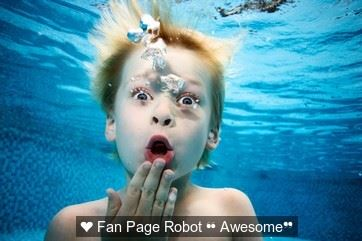 Now with Fan Page Robot, you can fetch any video from a web page (not just YouTube) and get it ready for Facebook with just one click. First, enter a video page URL (or use the Video Search feature to generate video content). We support pretty much any major social media, video or news sites, such as YouTube, Twitter/Vine, Facebook, CNN, Yahoo, Imgur, IMDB, Sound Cloud, Udemy, College Humor, 9gag, etc. Then click on the video icon next to the URL input box. As long as the webpage has a video, the Robot can fetch it and convert it to a native Facebook video with the best available quality when you publish the post to Facebook. WARNING: Use this feature responsibly. DO NOT post any copyrighted videos, or your page will be suspended by Facebook. 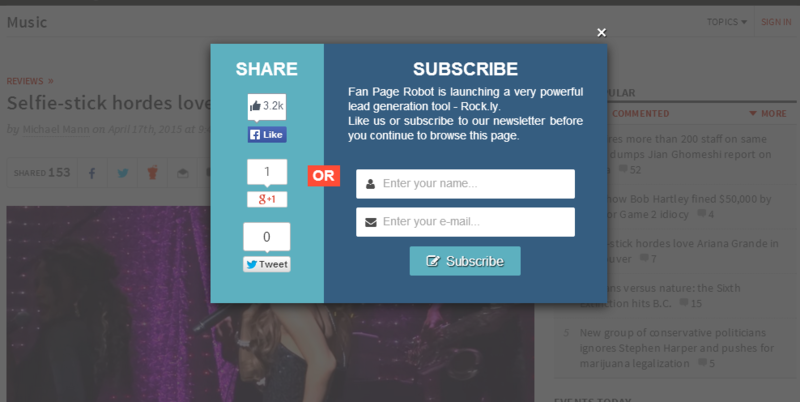 After you enable the "Notify Me" option in Content Mixer, we'll notify you by email when hot, new content is available. Now you can directly publish content from the notification email. August 6: We have a blog -- Social Media Marketing Tips! This blog serves as a knowledge base for our users. We're going to have the most successful social media experts to write case studies, best practices, tips and tricks on social media marketing and auto posting software. The content will focus on what works and what doesn't in the social media management field. Announcing a very exciting new module: Rock.ly Campaign Builder. But after they click on your link, instead of reading the article immediately, they will see your ad or subscription form first. There are many stunning templates you can choose from to create your high-converting advertising and lead generation campaigns. A simple yet very powerful WYSIWYG ad builder is available for you to customize them and make them look like what you want within a few minutes! After creating your campaign, the Robot can automatically turn all the links you will be sharing into your Rock.ly campaigns! A traffic report is also available for every link you've shared. And yes, autoresponder is supported. The subscription form is integrated with 10 major email marketing programs: AWeber, MailChimp, GetResponse, iContact, Campaign Monitor, Mad Mimi, Benchmark, ActiveCampaign, Interspire and Sendy. There are a lot of other features that you can find within the Rock.ly Campaign Builder! Just try it out and you will love it! While we're busy working on a new lead generation feature, we’ve recently released some improvements on the existing features. 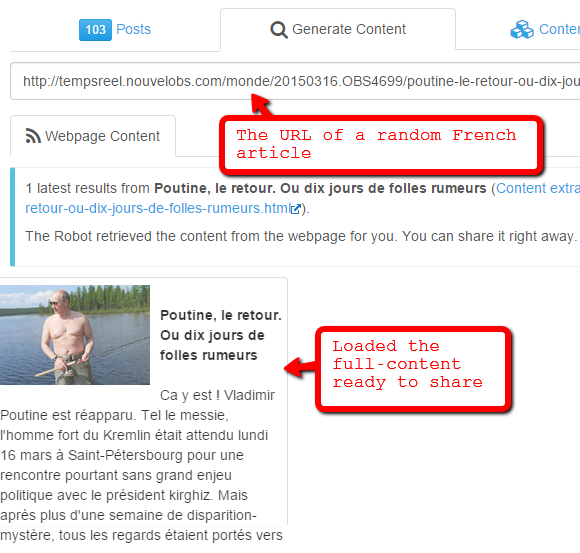 With the Content Generator on Fan Page Robot, now you can enter the URL of an article and it will extract the main article from the webpage. If you enter the URL of a category page or homepage of a website, the Robot will find the latest articles on the page, go to each of them, and extract the full-content from the articles. 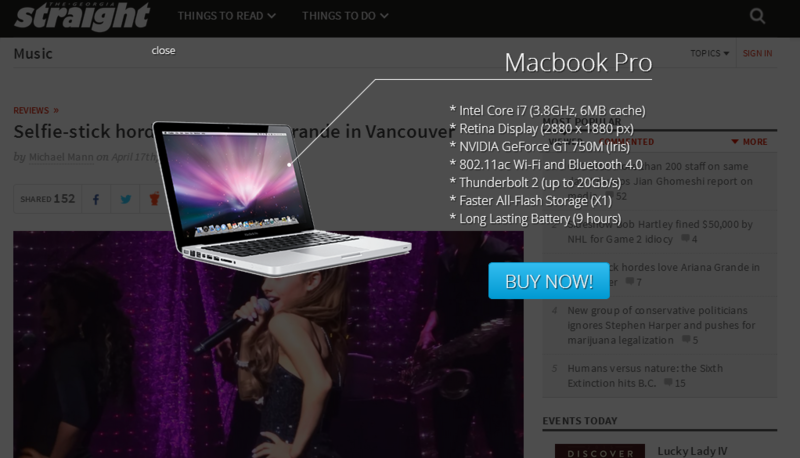 The full content the Robot loads for you is ad-free and well-formatted. It works for all languages. 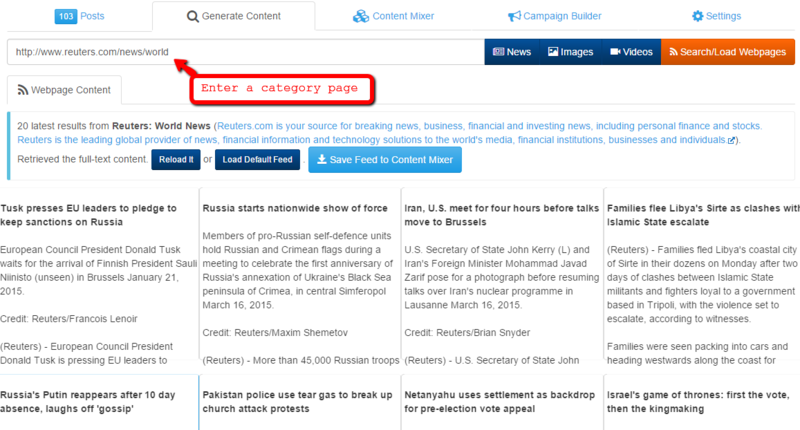 When you want to share multiple articles from a category, or want Fan Page Robot to notify you or autopost the articles from the category once it has new updates, you can enter the URL of the category page, e.g. http://www.reuters.com/news/world. 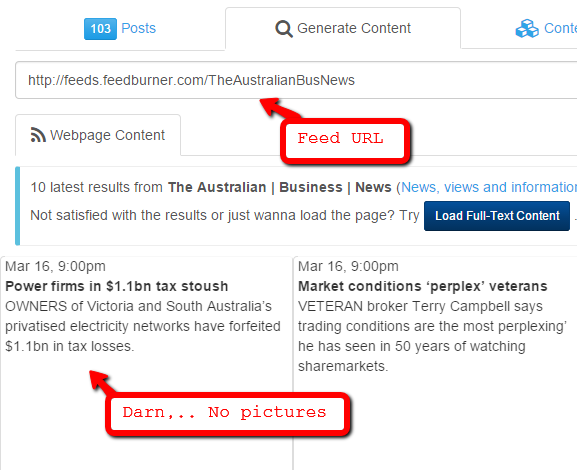 The Robot will try to load the summary feed (default feed) that is provided by the website first. Then you can choose to load the full-content feed which is generated by the Robot. 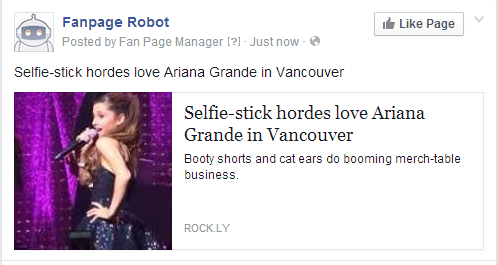 This isn't news, but we just want to make sure you know that the Robot can always load content from any public social media pages, e.g. 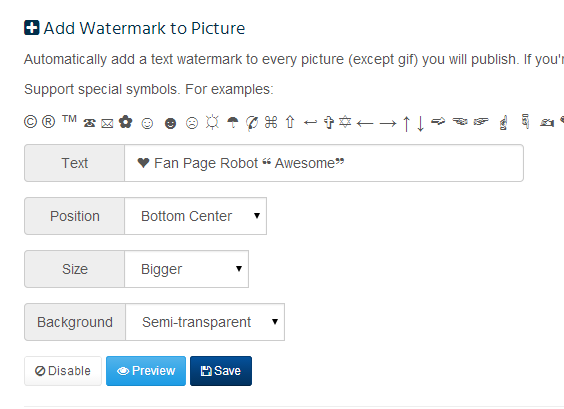 Facebook, Twitter, Tumblr, Pinterest, Instagram, Youtube Channel, etc. .
Now you can automatically add a text watermark to every picture (except gif) you post. You can turn it on in Settings for each fan page you have. Just be sure you have the right to reuse and modify the images that you're going to use. The text supports multiple languages and special symbols. More symbols here. 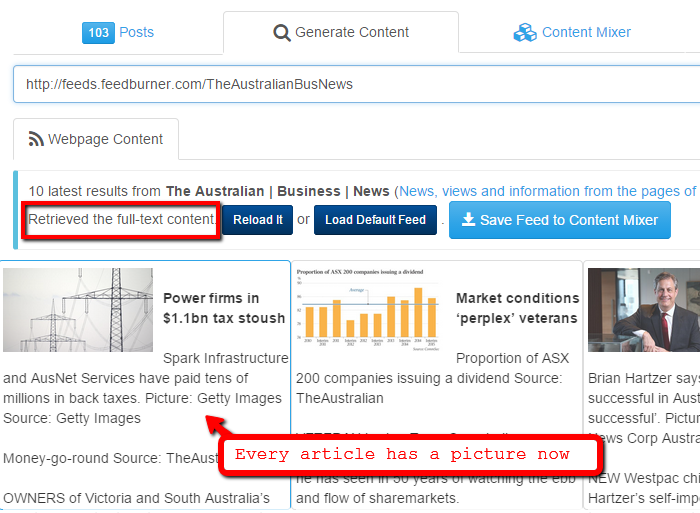 If you're using the Autopost feature in Content Mixer, you will need to check "Add Watermark" to turn this feature on for the content source that you're using. We're excited to announce that Fan Page Robot now is also a LinkedIn autoposter. You can publish your content to your LinkedIn profile or your company page from our message box or in Content Mixer. You can turn this feature on in Settings and connect different LinkedIn accounts to different fan pages.